For record labels, bands and solo musicians. Need a custom band website design? Want the ease of editing that WordPress offers, but not the hassle of setting it all up (including all the technical stuff that comes with it)? I’m your guy. You can hire me to create a fitting visual online representation for your music. Contact me for a free chat; no strings attached. Music and its design (should) form a whole. Music is one part of the presentation and its artwork is the other part, they’re not separate things. That’s why I strive to create unique band websites that are unified with their music, to ensure that the online experience is a matching representation of that music. I design and build custom WordPress band websites, to offer you an easy way of maintaining and editing your own site while also having a completely unique design. 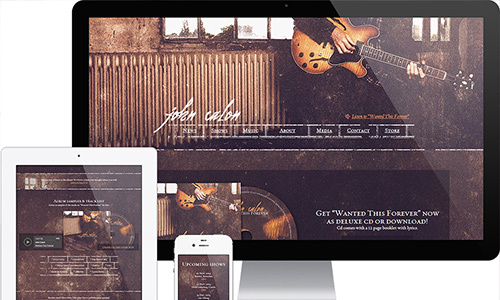 The WordPress band sites I make are fully responsive and optimized for display on any and all (mobile) devices. And I also include several integrations with third-party services such as CDBaby, SoundCloud, YouTube and more. All to create an amazing online band website experience. Are you performing in a band, or as a solo musician? Let’s talk and see if I can create a unique band website for you.